HAL surprises with a minimalistic games that shows off gameplay in a pure form. The result is a fun, worthwhile experience which only drawback is that it never really provides a big challenge. It was almost a side-note during Nintendo April 1st Direct presentation. A new eShop game from HAL laboratory. You know, the studio behind Kirby and the Smash Bros. franchise. Even better the game was available almost immediately. So what happens when the studio behind Smash Bros. goes indie? Read on to find out. From the second you start Boxboy! it’s immediately apparent that this is a very minimalistic game. Not trying to directly compare it reminded me of the works of Dutch painter Mondriaan, who is known for his abstract style. In a sense Boxboy! feels like a puzzle game in it’s purest form. The graphics are purely functional but still manage to have character. Levels are equally minimalistic and functional. Nothing more, nothing less. Boxboy! 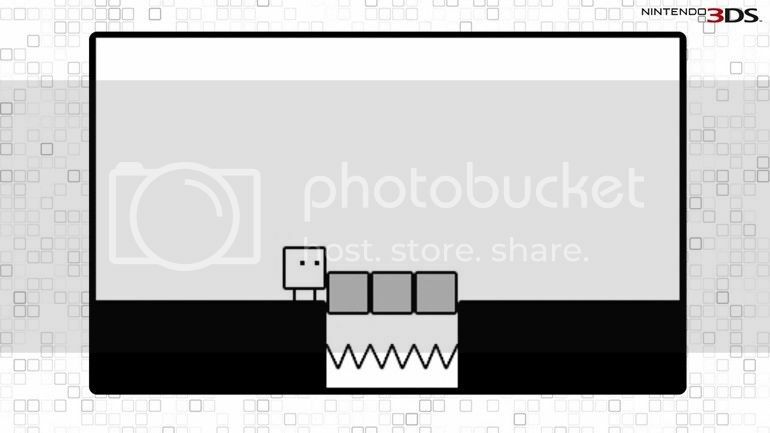 is a block puzzle game where you control Qbby, a block. 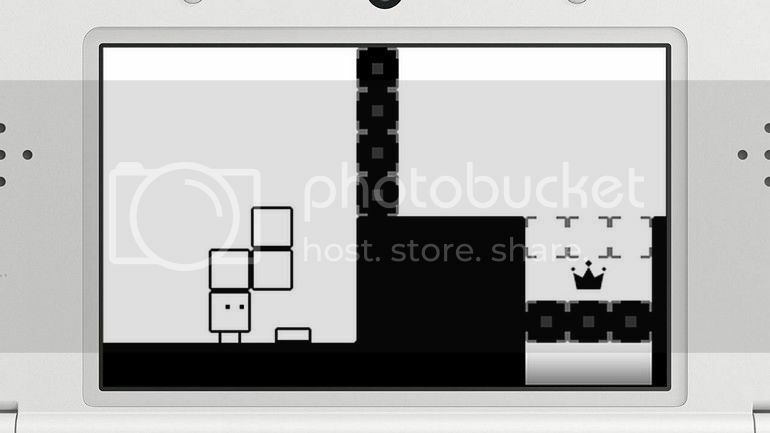 Qbby’s main ability is to produce a series of blocks in one of four directions. With this ability he needs to traverse a total of 17 worlds. Each world is themed around a certain way to use the blocks. In each world there are several levels that you need to traverse. Getting to the end is the main goal of each level. But they also contain crowns that you can collect using less blocks than that level’s set limit. 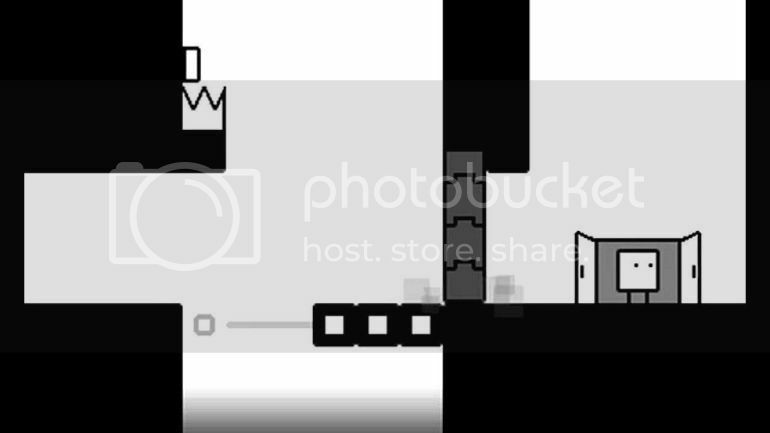 Per level the amount of blocks that Qbby can produce at a time is different and using that limit is a big part of the challenge this game offers. The game gently guides you into the gameplay mechanics. Levels usually take no more than a few minutes. But when you get stuck it can take take a while longer. Keeping track of how many blocks you have used is relevant if you want to find all the crowns. But this “block management” is hardly a big part of the experience. The game is very generous with it’s checkpoints and pressing L & R buttons together will instantly send you back to the last one. This simple mechanic also drives home the focus on the gameplay’s essence: it’s puzzles. There is almost no starting over or backtracking. You try a puzzle and if you fail you reset. Try. Fail. Repeat. This makes for a very pleasant experience. When you do get stumped you know it’s all you and the game hinders you in almost no way. When you do figure it out you can’t help but smile at the cleverness of the puzzle and by proxy your own. An impressive feat for such a seemingly simple game. Even though the game is so minimalistic it still manages to tell a story. Even a story with character. A feat a lot of other more intricate games fail to achieve. But the story is purely additional. It never touches the gameplay in any way. The game does sport some additions through the game’s shop. Things like the games music, specific challenges and costumes for Qbby can all be bought with the tokens you earn completing the levels. Box boy! is gameplay in it’s essence masterfully executed by the veterans at HAL. The result is a fun bite-sized game that will have you smiling at it’s cleverness. It never really poses a challenge and that is the game’s real drawback. One that is easily mitigated by the simple fact that this is an eShop title with corresponding pricetag. If the title has you intrigued you’ll probably won’t be disappointed. As long as you don’t expect anything earth shattering.